Since starting this blog we discovered that my youngest son has celiac disease, and it is very likely that I have it also. I also have a child on the autistic spectrum so the boys and I are now eating gluten and dairy free. So here is the gluten free version of our sourdough pizza. The first thing you will need is a gluten free sourdough starter. You can make one yourself using kefir grains. I followed the instructions here to make the starter. Basically, you ferment 2 cups of apple juice with kefir grains for 24 hours. Then you remove the grains and stir 2 cups of gluten free flour into the fermented apple juice. I strongly recommend including some teff flour in the blend that you use. Teff is very good at attracting lactobacillus to your starter, much like rye flour does for those that can tolerate gluten. Leave this on the counter for an additional 24 hours, and you will have your starter. You may be able to use this to make your first pizza crusts, but it is likely to retain some of the flavor of the fermented apple juice so you might want to discard all but a small amount of this (1/4 to 1/2 cup) and feed it again using gluten free flours and water. This recipe creates a sourdough sponge as the base for your crust. To the sponge you will be adding other ingredients to help the crust hold together better in the absence of gluten. To make the sponge you will use a blend of gluten free flours and water, added to your sourdough starter. I keep my sourdough starter in a 1/2 gallon mason jar. I store the starter in my refrigerator between uses, leaving just a little behind in the jar. Sometimes I feed the starter the day before I want to use it, and let the sponge rise in the refrigerator for 24 hours. Sometimes I feed it about 8 hours before I want to use it, and let it sit out on the counter to rise. Either way is acceptable. If I let it rise in the refrigerator, I do take it out a few hours before I plan to use it, so it can come to room temperature. The blend of GF flours that I am currently using to make a sourdough sponge for pizza includes the following. You don’t have to use these exact flours but a little teff is highly recommended for maintaining the starter. These are approximate amounts. Blend thoroughly. This makes 2 to 3 large pizza crusts, depending on thickness and size. Cut a piece of parchment paper to fit your pizza pan. 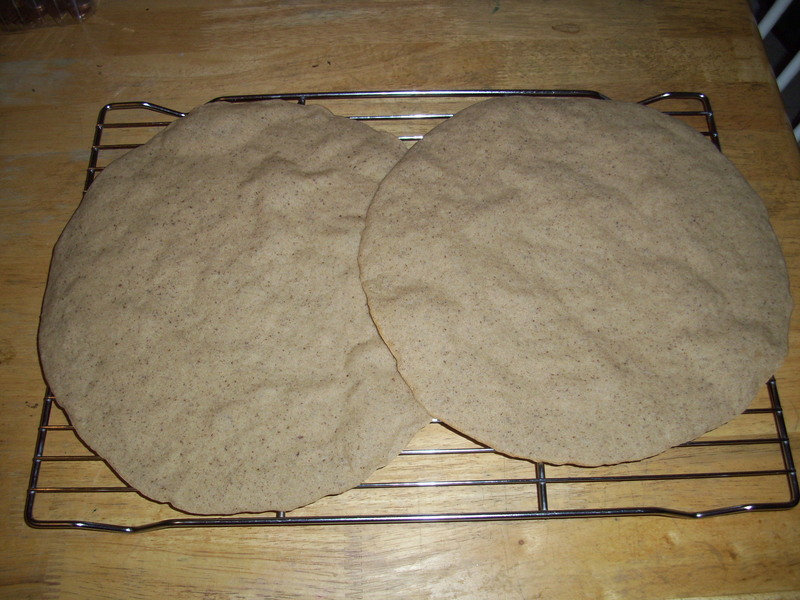 (I use a large air-bake pan and I spread the batter very thinly on the parchment to make 3 thin crust pizzas.) Spray the parchment lightly with olive oil cooking spray, then spread 1/3 to 1/2 of the batter on the parchment lined pan. Use the back of a large spoon to spread the batter out, much like frosting a cake. Leave a little extra thickness at the edges to form the crust. Bake in a 400 F oven for 10 minutes. (I use the center rack) I usually prebake all the crusts I am making, one right after the other, and place them on a cooling rack. When the last one is baking, I take one that is already baked and start putting toppings on it to ready it for the oven. 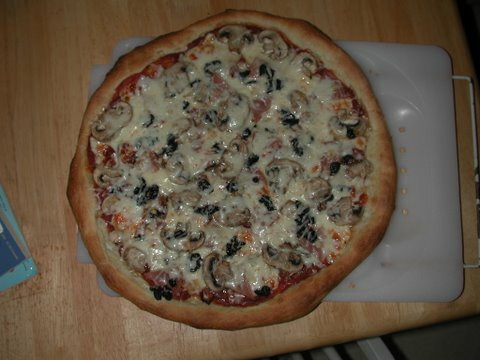 I increase the oven temp to 425 – 450 to bake the crusts again with the toppings. Since I am nightshade free, I either make a “no-mato” sauce or pumpkin pizza sauce (see below crust recipe). We use Daiya cheese to keep our pizza dairy free. We also use a variety of toppings. We are not vegan/vegetarian so I almost always add meat to make up for the fact that Daiya cheese contains next to no protein. Perhaps those that are vegan or vegetarian might have other ideas for adding protein. 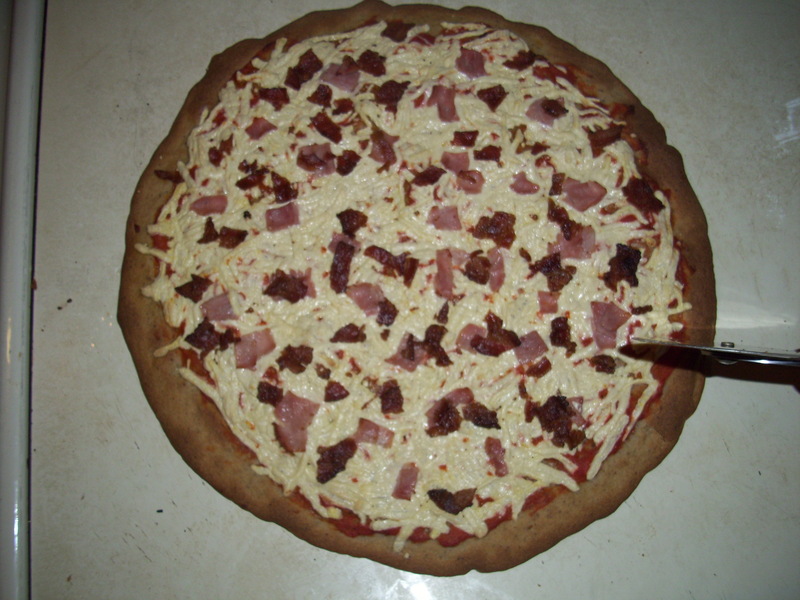 I bake the crusts with the toppings for about 12 to 15 minutes, depending on the moisture content of the toppings. It’s very easy to whip up a batch of pizza dough using sourdough starter. If you don’t have a sourdough starter, one of the most reliable is Carl’s Starter. Click here for the address to mail a request for a dry starter. If you are just beginning the process with dry starter, you will need to follow the instructions for reviving the start before you can use it. With sourdough, it does take some time to rise so you will need to plan ahead. You can make the dough the night before and put it in the refrigerator overnight. Take the dough out in the morning to rise at room temperature and you can have pizza for supper. Or, you can make the dough in the morning and let it rise for 7 to 8 hours. Sourdough that you make about 24 hours ahead, with part of the proofing taking place in the refrigerator, will have a lower glycemic index. If you are interested in learning to bake bread, sourdough pizza is a good place to begin. Pizza dough is very forgiving to work with. I have made batches over the years that were a little too dry or too moist, over or under risen, but they all taste delicious when you put some toppings on them and bake them up. With bread, you need to be a little more precise in order to get the loaf to rise properly, but pizza dough only needs to rise a bit to form the crust. We have come to enjoy our homemade pizzas so much that we now prefer to make our own than to order out. Mix together all ingredients except flour. Stir flour in gradually until you have enough to form a stiff dough. Knead until smooth, adding small amounts of flour if the dough is too moist. Let rise at room temperature until doubled, about 7-8 hours. Roll out or gently shape with hands until the dough is just slightly larger than your pizza pan. I find this dough fairly easy to lift and transfer to the pan, because of its elasticity, but it can also be patched with a bit of dough from the edge of the crust, if it happens to tear, and it will still come out fine. Once you have it in the pan, you can shape it a little to form the crust. If you like a thin crust pizza, you can put the sauce and toppings on and bake it right away. If you prefer a thicker crust, you can let it rise for up to an hour before adding toppings and baking. I always double this recipe, and it makes 3 thin crust pizzas (when doubled). I use a pizza stone, but you can use any pizza pan that you like. Metal pans will need to be greased prior to use. Stoneware pans that are not seasoned should be greased with palm shortening. You may need to reduce the baking time by a minute or two for metal pans. I preheat the oven to 450 F, and bake the pizza for about 10 to 12 minutes on the lowest rack until the cheese is lightly browned. My oven runs a bit hot and tends to brown too much from the top. For some ovens, you may need to bake at 475 to 500 F and/or use one of the middle racks. Check the pizza after 10 minutes of baking time and adjust accordingly. Pizzas with more toppings will take a few minutes longer, as will thicker crust type pizzas. I discovered a few years ago, that even the “healthiest” boxed breakfast cereal does not make a very healthy breakfast. Even without the sugar, the grains in the cereal experience high temperatures and pressure as they are extruded from a machine to form various shapes or flakes. This denatures the protein in the grain and destroys nutrients, possibly including the nutrients that are added to the product to provide various vitamins and minerals. In addition, grain that is not soaked in an acidic medium or sprouted prior to preparation contains antinutrients, such as phytic acid, that block the absorption of the few nutrients remaining in the cereal, bread, or other grain product. Therefore the modern processing methods used the make boxed breakfast cereal are rather incompatible with good nutrition. For more information, read section on cereals in this article. The buttermilk, kefir, sour raw milk, or whey in this recipe provide the acidic medium to make the flour more digestible and nutritious. For your health and the health of your children, it is very important that your milk products come from grass fed animals. The milk should not be pasteurized or homogenized, as this destroys nutrients and enzymes. To learn why, visit www.realmilk.com. If you would like to make fresh buttermilk for the recipe (and butter) you can learn how here. 1. In a large mixing bowl combine the whole wheat flour, all purpose flour, sourdough starter, and buttermilk. Beat until blended. Cover and refrigerate overnight or for at least 8 hours. (I use the kitchenaid bowl and just put a lid on it and stick it in the fridge.) Ideally, you would use freshly ground flour, but lacking that, King Arthur flour is one of the better quality commercial flours available. 4. 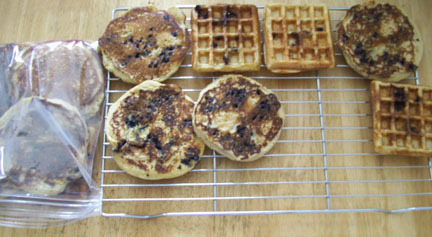 Preheat pancake griddle or waffle iron. For the pancake griddle, I suggest cast iron or as a second choice, stainless steel. You should avoid using nonstick pans for health reasons. I use palm shortening in my pan but lard or bacon fat make wonderful pancakes too. Ghee can also be used. I use olive oil spray for the waffle iron because it is the only thing that keeps me from taking the waffles out of the iron in pieces. Generally I make pancakes and waffles at the same time so I can freeze the leftovers for breakfast on a few other mornings. I find that medium to medium low heat works best for the pancakes on MY stove. I do find on my electric stove that the pan gets hotter as I cook and I need to turn it down a little. Flip the pancakes when bubbles form and pop. They should take about 1 to 2 minutes per side, depending on how hot your pan is. I set a timer to keep me from burning them. I am currently doubling this recipe because it buys me a few more easy mornings where the kids can warm up their breakfast by themselves using a toaster or toaster oven. I am *so* not a morning person. Hi and welcome to my blog. I am a registered nurse with over ten years of experience in pediatrics and an interest in holistic practices. I have two sons, J. who is just a few months shy of 8 years, and S., who is 5 years old. My children are what made me “crunchy.” My eldest son was diagnosed with Asperger Syndrome at age 5, and my youngest son has had multiple health challenges since infancy, but currently his primary challenge is low muscle tone.